"It’s probably one of the most valuable short courses that I have ever taken, and I wish more engineers at Fermilab would be able to take it as well." Have you endured years of cost-cutting, downsizing, and quality improvement? These efforts alone are not enough to ensure long term survival. You need an innovation partner who has both knowledge and practical experience with the latest innovation tools and processes. Those partners are Jack Hipple and Mark Reeves. Mark and Jack are innovation specialists with over 60 combined years of industrial experience. They have special expertise in the new breakthrough TRIZ (Russian acronym for "Theory of Solving Problems Inventively") methodology. Innovation-TRIZ is the only consulting firm with training and access to all major creativity assessment and problem-solving tools, giving them the unique capability to provide the best tools for the client's needs. If you think you are using all your resources, check this out, Don't Take Anything For Granted. I attended your three day ASME TRIZ class in San Francisco back in June . It was one of the highlights of this year for me"--Greg Markham, P.E. I had the honor of being interviewed by Vern Burkhardt of IdeaConnection (Vancouver, CA) a while back in a 5 part series on TRIZ problem solving. I invite you to visit this link. Jack Hipple teaches TRIZ at Chicago PDMA - well worth the watch! Quality World, a leading British magazine, asked us to summarize TRIZ for its readers. Check it out here. We have written a series of columns for the Altshuller TRIZ Institute on the application of TRIZ principles in the business, management, and organizational area. Click here to go to this series on the Altshuller Institute web site. We recently published a new book! 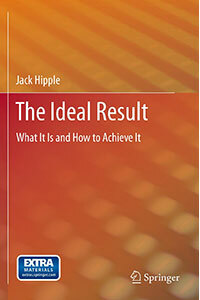 Please check out The Ideal Result: What It Is and How to Achieve It available here. in all significant innovation assessment and creativity tools.